As I was going about my day, like I normally do, rushing here and there to get everything done, I happened to notice an elderly lady struggling with a walker. She was also trying to carry several bags of groceries, but because she relied on a walker to get around, she was having a very hard time. Now understand this wasn’t an isolated incident, in a rural area, but in the middle of a busy city – a local bus station. There had to be at least twenty people around her, including myself, but no one seemed to notice this lady’s struggles. As I rushed to help this poor dear, I muttered to myself, “Are so many people blind?”. Actually, there are many, many people of the world who are very blind. Blind to what is really right in front of them. Have we became so complacent in our society, that we ignore an elderly lady struggling just to get around? Have we become so immune to violence that we would rather post a violent video we caught with our I-phone on social media, than actually step in to help when we see someone being hurt? Have we so bought in to our culture of instant-gratification, that we expect our needs be met in a heartbeat, without actually putting in any work? What does it take to have our eyes opened? In Mark 10:46-52, Bartimaeus, the blind beggar, knew exactly what, or more importantly who, could grant him the gift of sight……could open his eyes. How did a blind man recognize that this person, Jesus of Nazareth, could not only help him, but heal him? It took a blind man to see what was right in front of him. He recognized Jesus, and knew He was the ultimate healer. Yet, he couldn’t see. He starts by yelling very loud, much to the chagrin of those around him. They try to silence him, thinking him a fool, or not worth our blessed Savior’s time. But Jesus, in His infinite grace, calls the man over. He asks, “What do you want me to do for you?”. This is a very loaded question. If you had a magic genie that you knew could grant you any wish, what would you wish for? Wealth, fame, beauty? As we know, the blind beggar only wanted one thing…..to see again. He could have asked for anything, but he asked for one thing. His wish was to have his sight restored. But, I think this dear soul saw more than anyone around him. He, though blind, recognized the Son, believed in Him and knew to trust that he would be healed. I’ve read a lot of commentary on this one little piece of scripture, and most focus on the miraculous healing of Bartimaeus, the fact that a blind man can finally see. But I think he saw more, though he was blind, than many folks can see now with perfect eyesight. He recognized Jesus, knew he was the Son of David, and knew that He could heal him. He put his entire trust and faith in this person, whom he had never met. And Jesus, because He recognizes the strong faith in this young man, responds with, “Go; your faith has made you well.”. So, a blind man can see, and we can assume because of this, he no longer has to beg to live. So ask yourself this? Are you blind? I’m not only talking about the elderly woman I saw today, struggling to carry groceries, who’s hardship appeared to go unnoticed by those around her. Would Jesus have ignored her struggles? But, I’m also talking about faith. 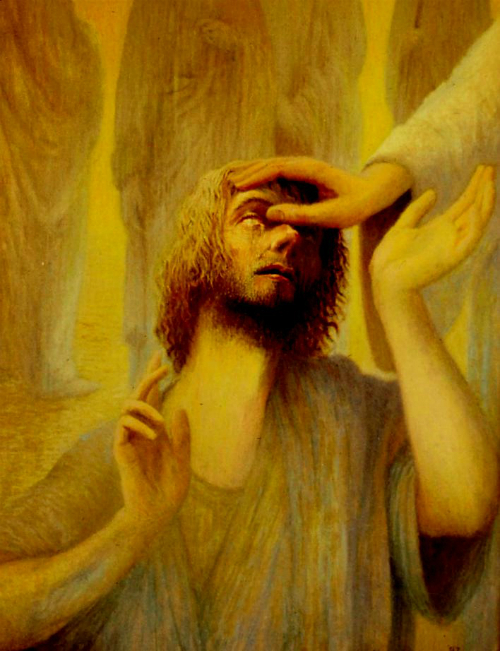 If a blind man can recognize our blessed Savior, and know that all he had to do was ask, and his sight would be restored, can we not also put our trust in this same Savior? What does it take for you to recognize Jesus, throw off your cloak of doubt, and simply ask (through prayer), for what is your most crucial need? Must you be like this blind beggar, to really see?? ?